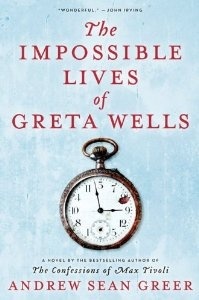 Greta Wells falls into deep depression following the death of her twin brother, Felix, who succumbs to AIDS in 1985. She and his partner, Alan, assist in his suicide once his illness becomes unbearable. Soon after, Greta’s own long-time lover, Nathan, leaves her for another woman. Ostensibly it’s because he decides he wants to have children, just not with her. Devastated from her losses, when antidepressants fail to pull her out of her agony her psychologist decides to try electroconvulsive therapy – formerly know as shock treatments. Though reluctant, she agrees. She’s scheduled for three months’ of the therapy, after which the doctor believes her brain will be “re-set” and her emotional health back to normal. During the period she’s enduring the treatments she’s warned she may hallucinate and feel unlike herself. Turns out that’s an understatement of epic proportion. In brief, what happens is during each treatment she’s transported to different time periods: 1918, 1941 and 1985. She’s physically in each year, as an alternate version of herself living a similar life, but is unaware what’s transpiring in each until she (1985 Greta) gets back there and learns the fall-out of her actions. From that she’s able to piece together what she’s done while she’s been away. In 1918 and 1985, her beloved Aunt Ruth is her confidante. She knows Greta’s situation and is a very open-minded, New Age sort of woman who believes “astral travel” possible, so naturally she acts as Greta’s link, helping advise her. Others Greta loves are also in each “life”: Nathan, Felix, Felix’s partner Alan and a man named Leo, with whom Greta falls in love while Nathan is away as a doctor during WWI. The roles of each of these people vary in each time period. Their situations are different, according to how each scenario is playing out. The premise at the heart of it all is Greta’s goal is to try and fix everything that’s wrong in each time period, righting wrongs and saving everyone she can, at the same time unaware how she’s handling things when she isn’t there. I’ve not read Greer’s other novels but I understand time is one of his recurring themes. For the most part, I thought he handled Greta Wells gracefully. At least 2/3 of the novel entranced me; I could hardly stand putting the book down. After that honeymoon period it all just got to be a bit too much. I’m fine with the fantasy angle. I can suspend disbelief when a book’s well-written but when I fell off the wagon of admiration I fell hard. At that point I stopped caring much which year Greta wound up in because things were too well-orchestrated. Too easily manipulated to meet her desires. Who has that much control over life? Shouldn’t some of the book be realistic, enough to feel identifiable? And his prose was lovely, so it’s not that, either. Rather, the book was missing a plot point that could have provided much satisfying complexity. One possibility could have been a well-developed plot line leading the reader to question if this had all truly happened or if it had been a dream, the result of Greta’s shock therapy. Another could have been a foil, someone – or something – riding along with her, trying to disrupt what she’s doing. Anything that gave the book a quality of suspense would have been appreciated. As it is, it comes off as a Nicholas Sparks novel, with the prose quality kicked up several notches. The book has a soap-operatic feel. The ending I can’t tell you about but it left me conflicted. A little too saccharine for my tastes. From reading reader reviews at Amazon I know I would be stoned for going against the grain. Shut up and appreciate the romance, woman! Still, it would be a fine summer read. I would love to know what you think of it, if you disagree with me (probably) or see my point. No timeline is perfect; each offers losses and compensations. Felix’s stories provide an especially moving exploration of the limited choices available to gay people throughout history. The Gretas have surprisingly little solidarity, intruding into each other’s lives without warning or permission. While Greer too often skimps on the period details that can give time travel stories a sense of reality, the novel’s central questions—how does experience change us, and which relationships are worth sacrificing for—work to bridge its chronological jumps.